Ivy (plural ivies) is the common name for any of the evergreen woody vines and, rarely, shrubs that comprise the genus Hedera of the family Araliaceae, characterized by two leaf types (palmately lobed juvenile leaves and unlobed adult leaves), two stem types (slender, flexible juvenile shoots with aerial roots and thicker adult shoots without roots), and small flowers and fruits. In particular, they are known for their climbing or ground-creeping nature, which has made them popular for ornamental purposes. The term ivy also is used more broadly to refer to any climbing or creeping plant, such as Boston ivy or Japanese ivy (Parthenocissus tricuspidata) and five-leaved ivy or American ivy (Parthenocissus quinquefolia), both in the grape family (Vitaceae) and the Kenilworth ivy (Cymbalaria muralis) in the family Scrophulariaceae. However, this article will be limited to discussion of the Hedera genus. Ecologically, ivy is an important food resource for various animals. The flowers are very rich in nectar and are an important food for bees and other insects, and the fruit (although poisonous to humans) is consumed by many birds. Both the bees and the birds provide a function for the plants as well, with the bees involved in pollination and the birds in seed dispersal. The leaves also are eaten by the larvae of some species of Lepidoptera, including the small dusty wave (Idaea seriata), which feeds exclusively on ivy, as well as angle shades, lesser broad-bordered yellow underwing, scalloped hazel, small angle shades, swallow-tailed moth, and willow beauty. For people, ivies are popular as ornamental plants and for attracting wildlife. With their evergreen foliage and creeping nature, they are valued in covering unsightly stone walls, beautifying sides of buildings, houses, and other non-wood structures, and grown as ground cover. The chemical that makes ivy leaves and fruits poisonous to consume, hederin, also is used medicinally to treat various respiratory disorders. Araliaceae, the flowering plant family to which the genus Hedera belongs, is also known as the ivy family, as well as the aralia family (after its type genus Aralia). The family includes 254 species of trees, shrubs, lianas and perennial herbaceous plants. The term liana refers to any long-stemmed, usually woody vines that begin in the soil at ground level and use trees, as well as other means of vertical support, to climb up the supporting structure. Members of Araliaceae usually bear pinnately or palmately compound leaves, and usually have small flowers produced in large panicles. The genus Hedera includes about 15 species of climbing or ground-creeping evergreen woody plants. On suitable surfaces (trees and rock faces), they are able to climb to at least 25 to 30 meters above the basal ground level. Ivies are native to the Atlantic Islands, western, central, and southern Europe, northwestern Africa and across central-southern Asia east to Japan. Ivies have two leaf types, with palmately lobed juvenile leaves on creeping and climbing stems, and unlobed cordate adult leaves on fertile flowering stems exposed to full sun, usually high in the crowns of trees or the top of rock faces. The juvenile and adult shoots also differ, the former being slender, flexible and scrambling or climbing with small roots to affix the shoot to the substrate (rock or tree bark), the latter thicker, self-supporting, and without roots. The flowers are produced in late autumn, individually small, in 3 to 5 centimeters (1.2-2 inches) diameter umbels, greenish-yellow, and very rich in nectar. The fruit are small black berries ripening in late winter. Ivy fruits and leaves contain the a saponin, hederin, which is poisonous to humans but is also used medically for the treatment of respiratory disorders because of the substances spasmolytic, expectorant, and antiobstructive effects. 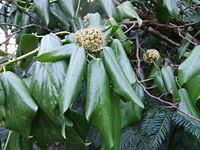 The most well-known species is Hedera helix, which is known as "English ivy" (or common ivy) and is widely cultivated. However, all of the species are largely allopatric and closely related, and all have on occasion been treated as varieties or subspecies of H. helix, the first species described. Some additional species have been described in the southern parts of the former Soviet Union, but are not regarded as distinct by most botanists. Regional English names for ivy include bindwood and lovestone (for the way it clings and grows over stones and brickwork). Ivy covering the exterior of an apartment near Kips Bay, Manhattan. Ivies are very popular in cultivation within their native range, both for attracting wildlife, and for their evergreen foliage; many cultivars with variegated foliage and/or unusual leaf shape have been selected. They are particularly valuable for covering unsightly walls. Ivies have however proved to be a serious invasive weed in the parts of North America where winters are not severe, and their cultivation there is now discouraged in many areas. Similar problems exist in Australia where the plant was originally cultivated in gardens. For example, in the coastal basins of California drought-tolerant Algerian ivy (H. algeriensis or H. canariensis) has been planted as a ground cover around buildings and highways, but it has become an invasive weed in coastal forests, and riparian areas (Cal-IPC 2006). Much has been argued as to whether or not an ivy climbing a tree will cause harm to it; the consensus in Europe is that they do not harm trees significantly, though they may compete for ground nutrients and water to a small extent, and trees with a heavy growth of ivy can be more liable to windthrow (uprooted or broken by wind). Problems are greater in North America, where trees may be overwhelmed by the ivy to the extent they are killed; this could be because ivy in North America, being introduced, is without the natural pests and diseases that control its vigor in its native areas. A more serious problem is that ivy creates a vigorous, dense, shade-tolerant evergreen groundcover (precisely the characteristics for which it is often cultivated) that can spread over large areas and out-compete native vegetation. Similar concerns are expressed about damage to walls. It is generally considered that a soundly mortared wall is impenetrable to the climbing roots of ivy and will not be damaged, and is also protected from further weathering by the ivy keeping rain off the mortar. Walls with already weak or loose mortar may, however, be badly damaged, as the ivy is able to root into the weak mortar and further break up the wall. Subsequent removal of the ivy can be difficult, and is likely to cause more damage than the ivy itself. Modern mortars that contain Portland cement and little lime are stronger than older mortar mixes that were largely composed of just sand and lime. Most mortar mixes changed to contain Portland cement in the 1930s. Soft mortar is still used when laying softer brick. If ivy is allowed to climb wooden structures, then the aerial roots are likely to enter into the wood grain causing the wood to split, allowing moisture and fungus to penetrate the wood and accelerating wet rot. Although far less toxic than poison ivy, which is unrelated to this genus, ivy contains triterpenoid saponins and falcarinol, a polyyne. Falcarinol is capable of inducing an allergic reaction (contact dermatitis), although it has been shown to kill breast cancer cells as well (Metcalfe 2005). The small black berry fruit is toxic to humans. California Invasive Plant Council (Cal-IPC). 2006. California Invasive Plant Inventory. Cal-IPC Publication 2006-02. Berkeley, CA: California Invasive Plant Council. Retrieved January 12, 2009. McAllister, H. A. 1981. New work on ivies. Int. Dendrol. Soc. Yearbook 106-109. McAllister, H. A., and A. Rutherford. 1990. [http://74.125.45.132/search?q=cache:QAUjDT2X9ngJ:www.watsonia.org.uk/Wats18p7.pdf+McAllister+ivies+1981&hl=en&ct=clnk&cd=6&gl=us&client=firefox-a Hedera helix L. and H. hibernica (Kirchner) Bean (Araliaceae) in the British Isles. Watsonia 18: 7-5. Metcalfe, D. J. 2005. Hedera helix. Journal of Ecology 93: 632–648. Retrieved January 12, 2009. Runkel, F., W. Schneider, O. Schmidt, and G. M. Engelhard. 2006. Process for preparing an extract from ivy leaves. USPTO Applicaton #: 20060210660. Retrieved January 12, 2009. This page was last modified on 20 January 2009, at 00:58.